What will Samsung Galaxy S9 look like? 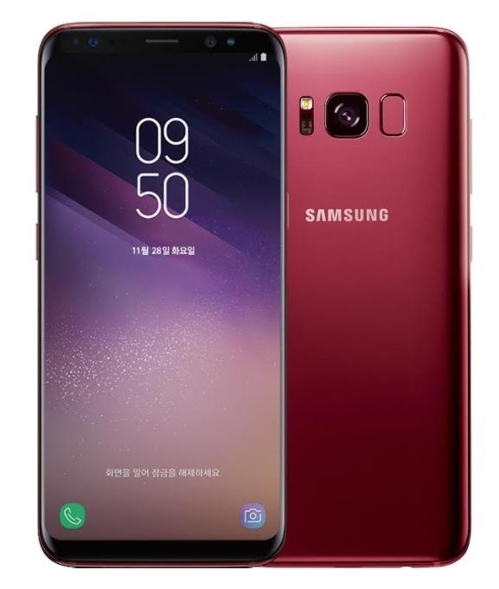 Samsung Electronics is expected to unveil its new flagship smartphone Galaxy S9 early next year with similar yet upgraded features to its predecessor Galaxy S8. The Korean tech giant is likely to unveil Galaxy S9 during the Mobile World Congress in February or its own launch event in March, according to industry watchers. Samsung took the wraps off Galaxy S5, S6 and S7 at MWC and Galaxy S8 at its own launch events in New York and London in March. Galaxy S9 is expected to feature similar designs and specifications to its predecessor Galaxy S8 with upgraded functions. The upcoming phone is predicted to sport the same Infinity Display and bezel-less design as Galaxy S8 and Galaxy Note S8 offer but with thinner bezels. The Galaxy S8 came with 84 percent screen-to-body ratio but Galaxy S9 is expected to come with nearly 90 percent screen-to-body ratio, meaning the front can be almost completely covered by panels. There have been industry speculations that Galaxy S9 may sport an in-display fingerprint scanner by ditching the fingerprint scanner on the back of the phone. Galaxy S8 put the fingerprint sensor on the back of the phone, drawing complaints from consumers who mistakenly touch the phone’s camera when trying to place their fingers on the sensor. The upcoming flagship smartphone is also expected to continue to have dual cameras and its camera will have optical image stabilization that produce photos that come out steady even with camera shake.